RAF airstrikes in Syria and Iraq have killed more than 3,000 militants from so-called Islamic State, Ministry of Defence figures suggest. Figures to the end of July show an estimated 2,684 fighters have been killed in Iraq since 2014. Another 410 have died in Syria since 2015, they suggest. The MoD said there was "no credible evidence" that it had killed civilians but said: "That isn't the same as saying we have not or will not do so." Airwars, a group which monitors civilian casualties from international airstrikes in the region, said it would be "statistically impossible" for the RAF to carry out hundreds of attacks without killing civilians. "Air strikes by all parties remain the primary cause of civilian harm in Iraq and Syria," said the group's director, Chris Woods. "The US, for example, has conceded around one (civilian) death for every 40 of its anti-IS strikes." US central command controls the bombing campaign against IS. It admitted in June that 484 civilians had died due to coalition airstrikes. A spike in the number of fighters killed came in the summer, when RAF Typhoons and Tornados joined the coalition and Kurdish effort to liberate Mosul. Most IS deaths in Syria resulted from strikes in Raqqa, the terrorist group's stronghold. While Mosul has been reclaimed, IS still controls large areas of eastern Syria and pockets of territory in Iraq. 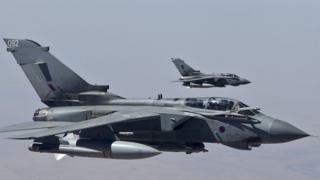 Can civilian deaths be avoided in RAF strikes on IS? The figures were obtained by the Press Association under Freedom of Information laws. The killings include those killed by Reaper drones - which are operated from the UK - as well as conventional fighter jets. In April, BBC analysis showed the RAF had dropped at least 216 bombs and missiles in the first 99 days of 2017. Defence Secretary Sir Michael Fallon, on a visit to British troops in Iraq, said that drone pilots could be awarded military medals. He also announced the creation of a medal for those who have fought IS, "the evil of our time". Speaking about civilian deaths from airstrikes, an MoD spokesman said: "Given the ruthless and inhuman behaviour of our adversary, including the deliberate use of human shields, we must accept that the risk of inadvertent civilian casualties is ever present."